Whether in the industrial and harbour area, Downtown, the surrounding villages or in the business park - in the Bus Simulator 18 you experience in a huge, freely passable urban area up close the exciting everyday life of a bus driver. Get behind the wheel of your 8 original licensed Mercedes-Benz, Setra, MAN and IVECO city buses and transport your passengers safely and on time to their destination - solo or with friends in synchronous multiplayer mode. As a bus driver in 12 different districts, face the challenges of the everyday traffic of a big city with everything that goes with it. Let not be disturbed by weather capers, potholes, traffic jams, black jackers, accidents, construction sites, night driving and extra wishes of your passengers. No, on the contrary: Take full control of your bus, earn money and reputation through a safe and punctual driving style and experience in the authentic urban areas almost limitless driving pleasure. 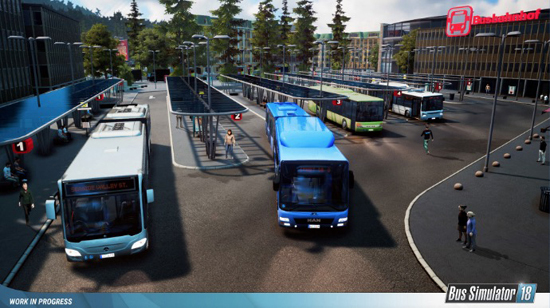 Thousands of virtual road kilometers drive you to new districts, new buses and new customization options for your buses. Due to the extensive modding support of Bus Simulator 18, there are almost no limits: Create routes, create your own buses, design bus liveries, create new maps and share them with the community, or download existing modding content from the Steam Workshop, install and expand your gaming experience. But be careful with your self-built buses! Do no harm and pay attention to the speed cameras distributed in the city. Your reputation and your wallet could otherwise be affected. So, what are you waiting for? Your shift is about to begin! Experience the everyday life of a bus driver in a huge, freely passable urban area. Manage original licensed Mercedes-Benz, Setra, MAN and IVECO BUS city buses and transport your passengers safely and on time to their destination - solo or in multiplayer mode.